Everyone has a favourite flower. For my grandmother, it was the iris. For my mother, it is the rose. For me, it's the peony. Learning how to grow your favourite types of flowers often requires more insight and knowledge than a summary 'how-to' on the back of a seed packet. Even books with growing and care instructions for a wide variety of flower types may not provide the in-depth analysis of your favourite flower type, or explore its varieties, its virtues or its troublesome pitfalls to the extent required for an avid devotee. 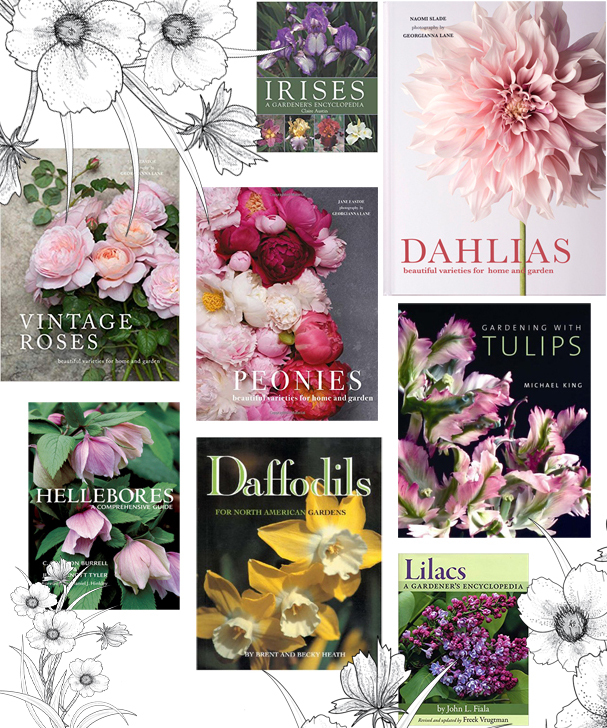 If you are passionate about one type of flower, it is worth looking for a book that immerses itself fully in the exploration of that type. Many flowers also have online discussion groups on social media sites, such as Facebook, that are devoted to them. And serious aficionados may find it helpful to join professional local flower societies that provide resources and information about your favourite kind. Below is a list of eight titles about single types of flowers that you might find inspiring and informative. I hope one of your favourite flowers is among them! British writer Jane Eastoe pens a comprehensive study of classic 'old' roses and some of their modern cultivars, which were developed to mimic the heirloom qualities of the true old-world varieties. The sixty types that are profiled were selected by Eastoe as those having the best fragrance, the most beauty for arrangements and the easiest to grow in the garden. Gorgeous photography by Georgianna Lane will leave you inspired. In her follow-up volume, Peonies, issued this year, Jane Eastoe applies the same selection method she used in "Vintage Roses" to sixty varieties of peonies: best fragrance, best looks, best for arrangements and easiest to grow. With commentary on each type, along with helpful growing advice and gorgeous photography by Georgianna Lane, the reader is enticed to grow these varieties at home. This is the most comprehensive study of garden irises published to date. A large hardcover encyclopedia profiling all known iris varieties known to the gardener, the book provides a breeding history of each type as well as how-to advice for planting and growing. More than 1,100 photographs depict the iris in all her guises. Widely considered to be the 'lilac bible' this book was first published in 1988 by American hybridizer John Fiala. The new edition profiles all of the 21 known lilac varieties and ten natural hybrids, as well as hundreds of the 2000 named cultivars. With an in-depth history of the lilac in garden landscapes around the world, as well as depictions in visual art, the book is beyond comprehensive. There are 580 colour photographs depicting many of the varieties. Photographer Georgianna Lane applies her visual talent to great effect in this beautiful book on Dahlias by Naomi Slade. The author's commentary unearths the flower's history from its Aztec origins and imparts practical, hands-on knowledge for growing and overwintering the Dahlia in wintry climes. All of the popular types are profiled, including Café Au Lait and dinner-plate varieties, as well as lesser-known types, such as Voodoo and Honka. This pictorial guide by Michael King presents a fresh approach to using these popular bulbs in contemporary gardens. The book begins with a history of tulips and moves on to design approaches and tips for various plant combinations. Twenty groups of tulips are described in detail, and a separate chapter deals exclusively with colour varieties, making it easy for readers to choose tulips to create a wide palette of colour combinations in their garden. Complete growing and maintenance instructions are also provided. A mere ten years ago, hellebores were considered a connoisseur's plant - subdued in colouration, hard to find, and the subject of much snobbery. Today, however, they are among the most popular perennials, thanks to their early bloom, long-lasting flowers, shade tolerance, handsome foliage and the profusion of new colours and forms that have become available. Authors Cole Burrell and Judith Tyler have produced what is arguably the definitive book on this genus, packed with comprehensive information on growing, maintenance, design, hybridization and selection, as well as trouble-shooting. The lavishly-illustrated volume will interest hellebore lovers at every level of interest. Hundreds of full-colour photographs depict the most popular and some of the rarer varieties of daffodils for the North American garden. Author Becky Heath provides a history of the flower as well as invaluable advice on planting and growing, including soil-amendment suggestions, fertilizers, when to plant, how deep to plant and how best to choose the bulb that is right for your region and garden. You're most welcome, Georgianna! Gorgeous photography!